Located next to the River Oaks District and less than a mile from The Galleria, the 34-story Arabella is one of Houston’s newest luxury highrises. A new luxury high rise project from Randall Davis, The Arabella offers a fantastic Inner Loop location and hotel-like amenities. Drawing inspiration from New York luxury highrises, The Arabella features unique contemporary architectural designs. NEW HIGHRISE DEVELOPMENT: The Arabella development broke ground in October 2015. 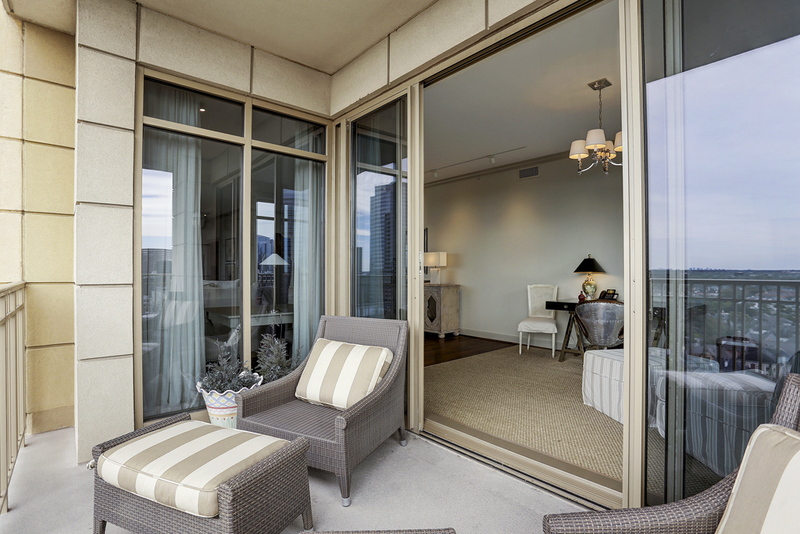 Featuring 34 stories with 109 units, The Arabella is one of the newest additions to Houston’s luxury highrises. Its developer, Randall Davis, features an impressive portfolio that includes The Astoria, The Marlowe, and Chateau Ten Sunset. LUXURY AMENITIES: The Arabella features luxury amenities that includes full service 24-hour concierge and valet parking, a starlight pool with sun shelf and hot tub, outdoor kitchen, bar and palm deck and pieds-à-terre for guests. Other building amenities include state-of-the-art fitness center, steam room, massage and sauna rooms and a fire pit. RIVER OAKS DISTRICT: The River Oaks District is just less than a mile away from The Arabella. The River Oaks District is an exciting 14-acre outdoor retail space with intricately landscaped streets. It houses more than 60 high-end boutique shops, streetside cafes, fine dining, and the iPic Theater. PROXIMITY TO THE GALLERIA: Housing the premier shopping trifecta, the Galleria is Houston’s shopping mecca with more than 30 million visitors annually. A few blocks from The Arabella, The Galleria is Houston’s largest mall with more than 350 shops and restaurants. Uptown Park and Highland Village are one mile away and features al fresco shopping and unique international and local boutique shops. 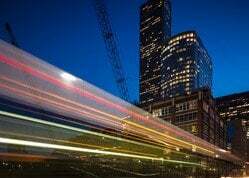 CONVENIENT ACCESS TO BUSINESS CENTERS: Residents are few minutes away from I-690 and Westheimer Road, providing residents convenient access to Houston’s key districts. Texas Medical Center is the world’s largest medical center with more than 50 research and medical institutions and around 100,000 employees. Downtown, featuring more than 3,500 businesses with 150,000 employees is just 12 minutes away from the building. Buying a condo in The Arabella can be tricky given the building’s design – higher floor units have larger floor plans, some units have private elevator entries, and certain views are superior to others affecting the value of the units. 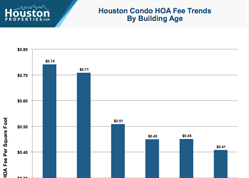 There are no historical sales trends (like you can find from some of Houston’s top performing luxury condos) because it is a new construction building. The Inner Loop is also home to numerous condo and loft buildings, each with its own pros and cons. An Arabella condo buyer would benefit from a good realtor’s advice, specially on how the building and unit compares to other residential condos in the district. To get personal advice on buying or selling an Arabella unit, contact Paige Martin, one of Houston’s best condo realtors and one of the top ranked Realtors in the United States. Enter your email to get this Free Guide To Houston Condos in easy-to-read PDF format. Bonus: Also see how The Arabella compares with nearby highrises. I am interested in The Arabella and would like to get more details. 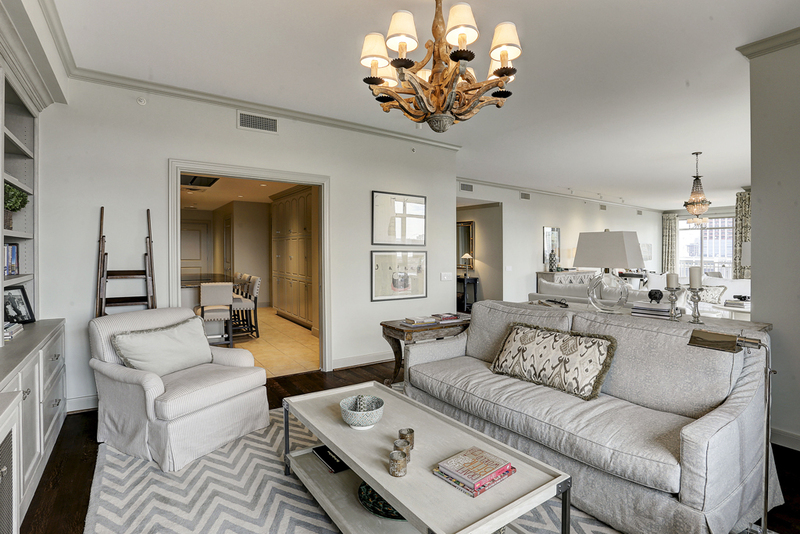 The Arabella has one of the best luxury condo amenities in Houston. It offers hotel-like amenities, including starlight pool, outdoor kitchen, pieds-à-terre for guests and state-of-the-art fitness center. The monthly HOA fee is $0.48 per square foot and covers common building services and amenities. 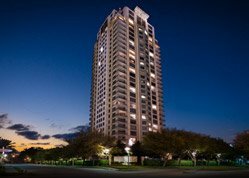 Located within the Briar Hollow neighborhood, The Arabella is the newest addition to Houston’s luxury highrises. As of this writing, sales trend are not yet available but more than half of the units are already sold. Units for sale have a list price between $800,000 to over $4,000,000. Briar Hollow real estate has continued to post strong appreciation trend over the past 10 years. 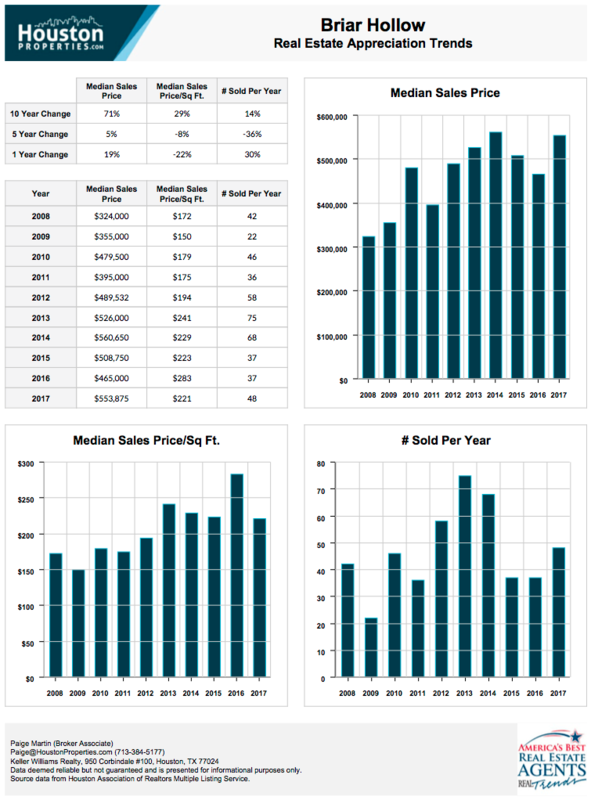 The median sales price in the area averages $500,000. Two new upscale highrise developments are located in Briar Hollow, The Arabella and The Wilshire. The Arabella is a luxury highrise condo along River Oaks District within Briar Hollow neighborhood. The Arabella is a Randall Davis and DC Partners highrise project, same groups behind the new luxury buildings, The Astoria and The Marlowe. Featuring contemporary design concepts, The Arabella draws inspiration from New York’s Upper East and West luxury residences. The building sits at 4521 San Felipe Street, Houston, along River Oaks District and 3 blocks from The Galleria. The Arabella features 33 floors with 99 residences and 14 penthouses. Named after New York’s famous neighborhoods lilke Upper East Side, East Village and Rockefeller, The Arabella’s 7 unique floor plans features two-, three- and four- bedroom units. Less than a mile away from The Arabella, River Oak District features posh social venues and landscaped streets. A premier outdoor shopping and dining destination, River Oaks District houses a collection of more than 60 high-fashion boutique shops, fine dining restaurants, cafes, and entertainment venues. The Galleria is just 3 blocks away from The Arabella. A popular shopping center, The Galleria houses more than 375 shops, 2 hotels, an ice rink and endless dining options. About 3 miles south of The Arabella, Memorial Park features miles of hike and bike trails, the Memorial Park Golf Course, and the 3-mile Seymour Lieberman Exercise trail. Several facilities for sports like volleyball, croquet, volleyball, swimming, and tennis are also available within the park. Residents have convenient access to Houston’s major job centers. Medical Center and Downtown are only 12 minutes away from the building. The Arabella offers hotel-like amenities like 24-hour concierge and valet parking, starlight pool with sun shelf and hot tub, pieds-à-terre for guests, state-the-art fitness center, and a pet-friendly walk area. 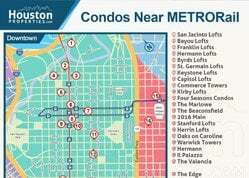 The condo building has immediate access to major freeways like I-610 and Westheimer Road. The Arabella units for sale are priced between $890,000 to over $4,300,000. 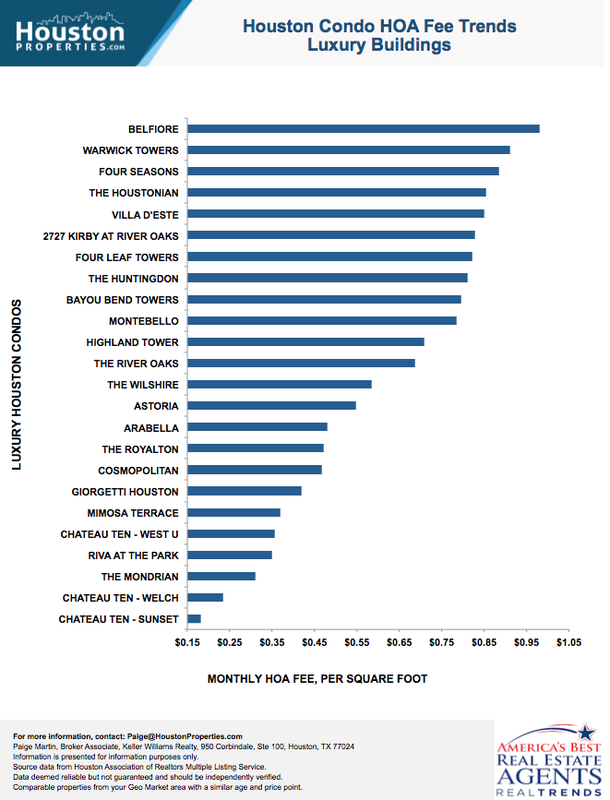 See the various pet policies of other Houston luxury highrises in the image below. I-610 and Westheimer Road are less than 2 minutes away from The Arabella. The building’s direct access to major thoroughfares provides residents convenient access to Houston’s key districts. Galleria area is Houston’s premier shopping mecca. The neighborhood houses Uptown’s shopping trifecta (The Galleria, Highland Village and Uptown Park), which receives more than 30 million visitors yearly and where residents enjoy upscale shopping, dining, and entertainment spots. Popular high-end retailers like Versace, Hermes, Versace, Giorgio Armani, Yves Saint Laurent and Bvlgari are within the premier shopping district. The Arabella sits at 4521 San Felipe Street within Galleria area, along River Oaks District and 3 blocks from The Galleria. 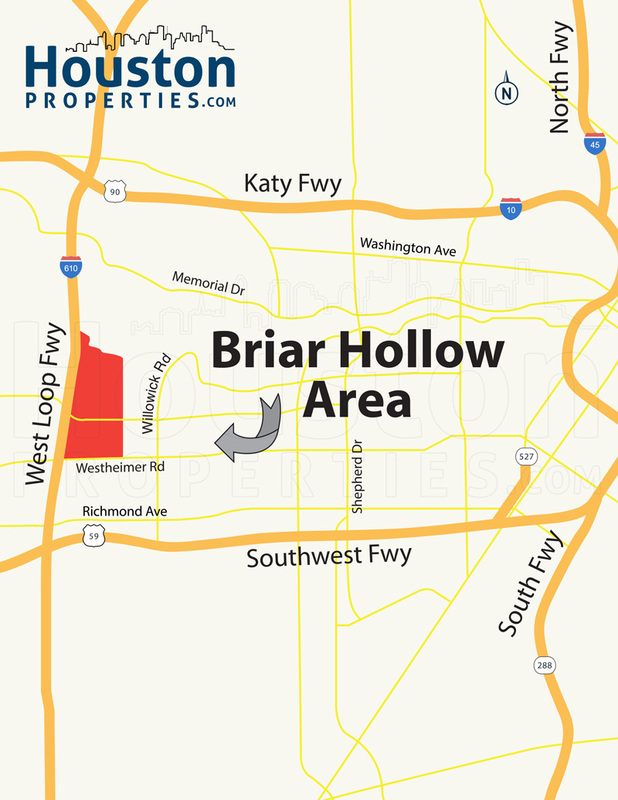 Briar Hollow is located between the River Oaks neighborhood and the Galleria area. Less than a mile from The Arabella, River Oaks District features several posh boutique shops, fine dining establishments, and premier entertainment hotspots. The Galleria is Houston’s largest mall with more than 350 shops and restaurants. Highland Village and Uptown Park are also just a few blocks from the building. Residents have convenient access to and from Houston’s key districts. About 10 miles southeast of The Arabella, Texas Medical Center houses more than 50 research and medical institutions with more than 100,000 employees. Downtown, featuring more than 3,500 business with 150,000 employees, is just 7 miles away from the building. The Memorial Park and the Buffalo Bayou, just 3 miles south of the building offers residents miles of hike and bike trails, the Memorial Park Golf Course, and the 3-mile Seymour Lieberman Exercise trail. Residents also get to enjoy facilities for various sports like swimming, volleyball, tennis, and skating. Briar Hollow is within the 77027 zip code of Harris County. St. George Place Elementary School at 5430 Hidalgo St. St. George Place Elementary is one of the HISD’s IB World Schools. It also offers a Vanguard neighborhood program for gifted and talented students, ESL, and special education programs. It features various enrichment courses and after school activities. Lamar High School at 3325 Westheimer Rd. 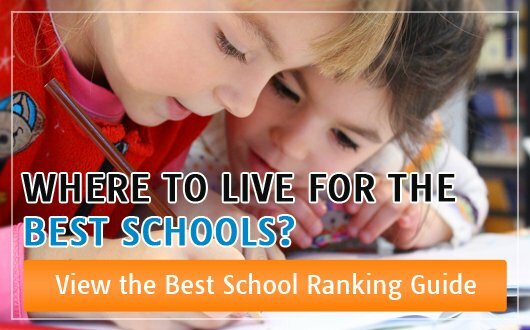 As one of the Houston ISD’s International Baccalaureate schools, Lamar has one of the largest IB programs in North America. It also offers a business administration magnet program, a neighborhood program, and an Advanced Placement program. The school also offers a great athletics program, with its football team (Lamar Texans, formerly Redskins) reaching the playoffs 30 times. Paige Martin is one of the most experienced and knowledgeable condo Realtors in Houston, and has a lot of experience helping people buy and sell at The Arabella.